This is perhaps one of our most interestings ways to stay in Copenhagen. 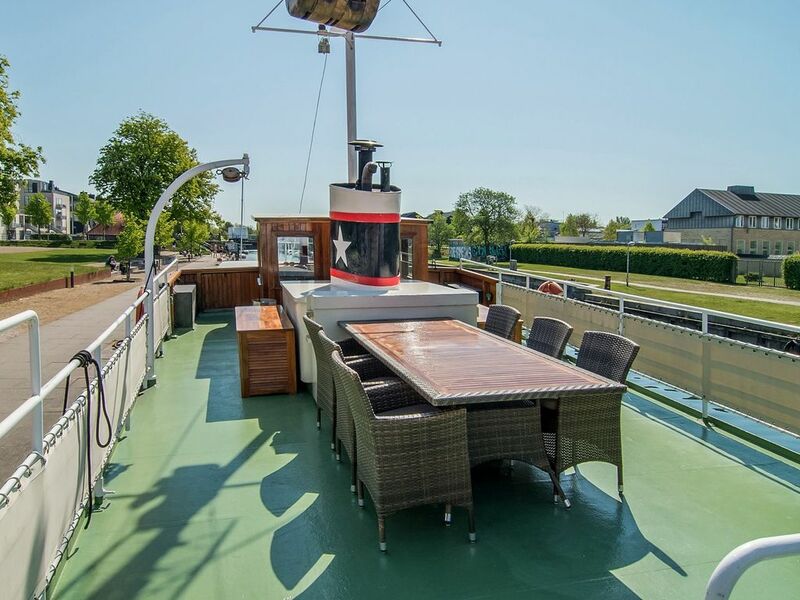 This houseboat with a 40 m2 balcony and all modern facilities is located just 300 metres from the Opera house. Even though the boat might be rocking in windy weather, this is an extraordinary experience to stay in the capitol of Denmark in this unique place. The houseboat has lots of style, warmth, soul and Scandinavian functionality. NB. Not suitable for walking impaired or for the disabled. Holmen is a very special part of Copenhagen and has until 1993 belonged to the Danish navy. But Holmen quickly transformed into an upper class residential area with many modern and luxurious apartments. At Holmen you will also find some of Copenhagen's best restaurants. If you want to go downtown you just take the Water Bus from the Opera House, located about 300 meters away, and voila, you're in Nyhavn in no time. The water Bus is quite an experience in itself and the prices are the same as other methods of public transport. All kilometer stretches starts from Nyhavn where the Water Bus will take you in no time from the Opera House. There is a lot to tell about this exciting accommodation. This is definitely one of Copenhagen's most unique accommodations. Gangway. Table with six chairs. 40m2 large sun terrace. Combined lounge, sitting room, dining room and kitchen with TV and fireplace. Patio with unique views. Toilet adjacent to the patio. In the lounge you can enjoy the fine views over the water and the Opera House sitting in the large sofa with a drink in hand. The kitchen has all modern facilities such as gas stove, dishwasher, washer and dryer. Of course there are both international TV channels and WIFI on board. Downstairs are the bedrooms and bathrooms and also space for clothes. Entering the cabins is like stepping into a whole new world of the ship. Here we perceive the boat's shape in a completely different way. All beds follow the boat's lines. Bedroom size is adequate. On the lower deck is the engine room and in there is also a washing machine. NOTE: This accommodation is not recommended for the walking impaired as you enter the boat by a ladder, and for tall people over 189 cm. In addition, there is another bedroom where the bed is 90 x 200 cm.